Music school is expensive! But there are lots of helpful tools that you can find for cheap. For any student, much less a student of music, life is expensive. For those in a university studying music, there’s tuition, fees, housing, insurance, food, miscellaneous expenses, etc. All of these costs add up quickly and for any student, this can quickly become quite cost prohibitive. To answer this, the following article presents a few helpful tips to lessen the financial burden of studying music and surviving music school on a budget. It might seem silly to point out the obvious, but sometimes it needs to be said. The library exists for a reason – sometimes you don’t have the cash on hand to buy the books you need outright. University libraries are usually replete with the scores and recordings you need for your assignments. If this is a concern as you’re getting prepared for college visits, take some time to visit the library to see if it will have the necessary resources to be useful during your stay there. Its a good idea to get to know some of the librarians, especially if they specialize in music. Sometimes they’ll know ways to navigate the catalog which you can’t get through on your own. For the beginning student of classical music, a vast and under appreciated resource comes in the form of a website similar to Wikipedia called the IMSLP/Petrucci Music Library. The acronym IMSLP stands for the International Music Score Library Project. Far from being an actual library, this virtual repository offers free downloads of scores. These scores can sometimes be found in multiple keys and often with a number of different editions. The pros of this library are that it is free and many of the editions are quite well-done. There are often links to performances, and sometimes also MIDI renditions of the pieces. The PDF files can be loaded onto an iPad (or other document reader). All that is required is that the student print the music (which usually ends up being significantly cheaper than purchasing the actual printed volume). There are a few cons, however. Sometimes more recent and contemporary repertoire is not listed at all. This is understandable, as the resource is meant to be utilized in a more academic fashion, and not for financial gain. This also brings up the second con – sometimes the music listed on the website will not be public domain in the student’s country. NOTE: It is STRONGLY advised that the student check the copyrights very carefully to ensure that the music he/she is downloading is allowed to be downloaded and used freely. A good rule of thumb is to give yourself about 100 years breathing room from the current year. Music Lessons Resource does not encourage or condone copyright infringement. For the more jazz-minded students, there is an analogue to IMSLP called Wikifonia. Similar to IMSLP, Wikifonia allows the browsing and downloading of jazz charts. However, in addition to simple browsing and downloading, Wikifonia’s template allows it to transpose the songs in its library up or down depending upon the student’s desired key. This is a huge bonus and it proves quite useful when looking for quick audition material for pop/jazz ensembles. The pros for this service are the great looking PDF files which show up cleanly on an iPad or other document reader. These files can be downloaded, or the MIDI files can be sent to a notation program such as Finale or Sibelius. The cons deserve some mention, however, as they have proven troublesome at times. Printing from Wikifonia is sometimes unreliable, as the noteheads choose not to show up. This is understandably a problem, as noteheads are a fairly important part of music notation. As with all bugs, if noticed, it should be reported to a system administrator. Copyrights should be considered, though in jazz music “borrowing” tends to be a bit more accepted. Regardless, use discretion when downloading. Music Lessons Resource does not encourage or condone copyright infringement. This little app is a favorite of mine. Piascore is a free app from the iTunes Store which allows one to load PDF documents onto an iPad, iPhone, and then view it without having to turn pages loudly. The program does more than just view documents, however. The student has the ability to write their notes into the document as if they were writing with a pencil into regular printed music. In addition to this function, the program includes a little keyboard to give starting pitches, a tuner (if the student is an instrumentalist), a metronome, a recorder, and a video player which links to YouTube (given an internet connection) which can give the student a view of the piece being performed while they read the score. Some other features include gestural page turning, syncing up with an iPhone for remote page turns, etc. The one big con to this program is its occasional difficulty to upload the scores. 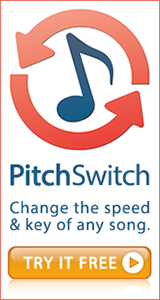 The PDF music first be uploaded to iTunes (just drag and drop) and then must be manually added through the Piascore app. Annoying, but worth the effort. This website is just the thing for students who need a bit of scratch staff paper. 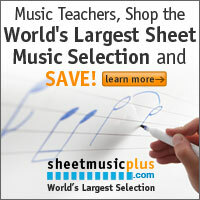 The handy options pane on the right allows the student to quickly and easily customize sheet music before printing. There are also links to pre-made staff paper which the student can browse if a special format is required. Pros are that the service is free to use and you can use it day or night. The cons are essentially that you’ll still have to pay for copies of the sheet music (assuming you’re printing at the university library). Or just borrow a friend’s printer. Either works. A fun idea for theory classes is to print a sheet or two of the paper and then laminate them. If you use a small dry erase pen, you can get lots of use out of that single sheet of “paper”. For the more composition-minded student, software will no doubt play a key role in the development of creativity and good notation habits. More students are learning notation from these programs because they make it easier to turn out beautifully proportioned, more legible sheet music. These programs are not to be used as a substitute for good notational sense, however. They are powerful tools, but any tool is only as effective as its user. That being said, MuseScore is a pretty cool tool to play with. It is absolutely free, being an open-source build, and there’s a broad community of developers who constantly play with the source code to improve it. The other big names in notation software are Finale and Sibelius (though Sibelius’ dev team has stopped working on further updates and the program will probably be phased out soon). Each of these programs will sell for around $300, making MuseScore a more cost effective solution for the student who doesn’t need a fancy sound library to make it sound as real as possible on the computer. MuseScore performs similarly to both of these programs, having an impressive number of features. The downside is that the menus are sometimes a bit difficult to navigate and the input isn’t as intuitive as it could be. Imagine trying to paint the Mona Lisa in MS Paint. You can do it, but it takes a bit more work than it would in another program. These are just a few suggestions for free and low-cost solutions to musical problems. If you’ve got any suggestions or other resources which can be shared, feel free to link them in the comments. Tagged budget, cheap, free, music, resources. Bookmark the permalink.